Stella McCartney "Timeless Basics" rashguard in solid microfiber. Crew neckline; half-zip front with ring pull. Golden logo plate at left chest. For in-store inquiries, use sku #1886728. Heidi Klein rashguard in striped, textured microfiber. Crew neckline; half-zip. Long sleeves. Formfitting. Pullover style. Nylon/spandex. Hand wash. Imported. Letarte rashguard in skull-patterned lace. Crew neckline. Long sleeves. Fitted silhouette. Pullover style. Lined bodice. Nylon/spandex. Imported. Letarte rashguard in solid microfiber with lace overlay. Partial zip front. Sleeveless. Slim fit. Pullover style. Micro nylon/spandex. Made in USA. 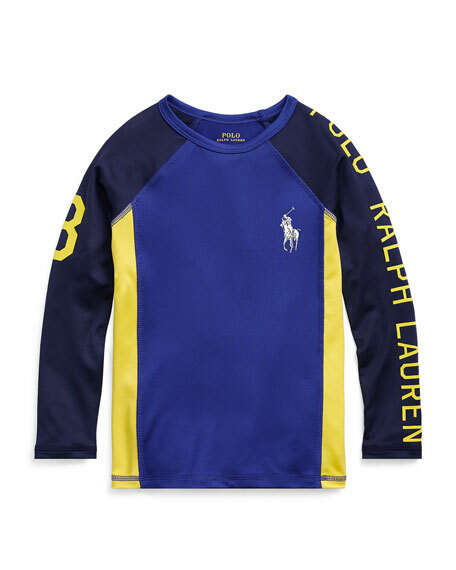 Ralph Lauren Childrenswear colorblock rashguard. UPF 40+ sun protection. Crew neckline. Long, raglan sleeves. Logo lettering down left sleeve. "3" detail at right sleeve. Signature logo at left chest. Pullover style. Polyester/spandex. Imported.